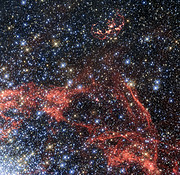 Astronomers have used the NASA/ESA Hubble Space Telescope to observe the remnant of a supernova explosion in the Large Magellanic Cloud. Beyond just delivering a beautiful image, Hubble may well have traced the surviving remains of the exploded star’s companion. A group of astronomers used Hubble to study the remnant of the Type Ia supernova explosion SNR 0509-68.7 — also known as N103B (seen at the top). 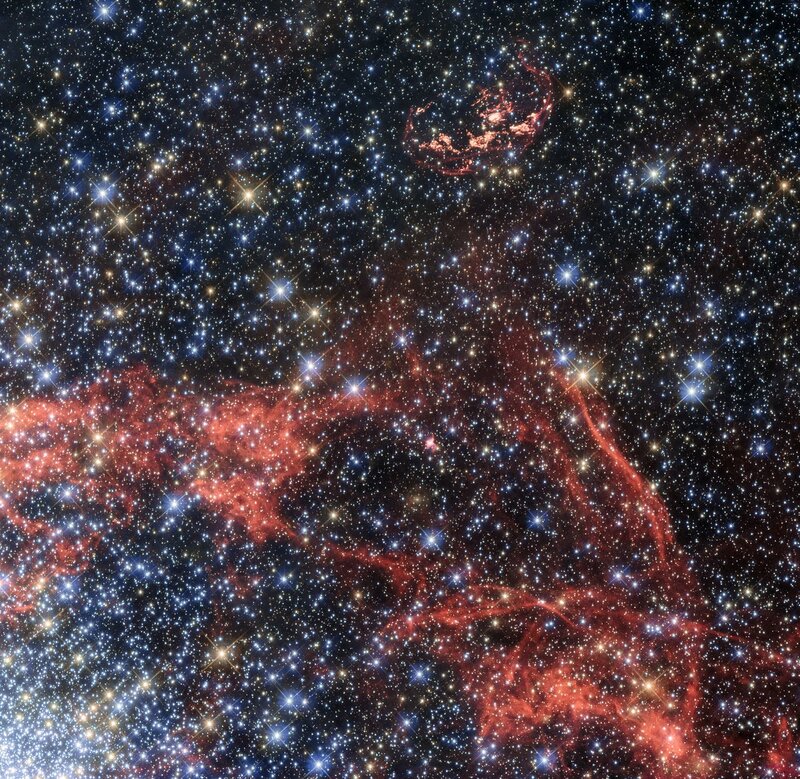 The supernova remnant is located in the Large Magellanic Cloud, just over 160 000 light-years from Earth. In contrast to many other Supernova remnants N103B does not appear to have a spherical shape but is strongly elliptical. Astronomers assume that part of material ejected by the explosion hit a denser cloud of interstellar material, which slowed its speed. The shell of expanding material being open to one side supports this idea. The relative proximity of N103B allows astronomers to study the life cycles of stars in another galaxy in great detail. And probably even to lift the veil on questions surrounding this type of supernova. The predictable luminosity of Type Ia supernovae means that astronomers can use them as cosmic standard candles to measure their distances, making them useful tools in studying the cosmos. Their exact nature, however, is still a matter of debate. Astronomers suspect Type Ia supernovae occur in binary systems in which at least one of the stars in the pair is a white dwarf . 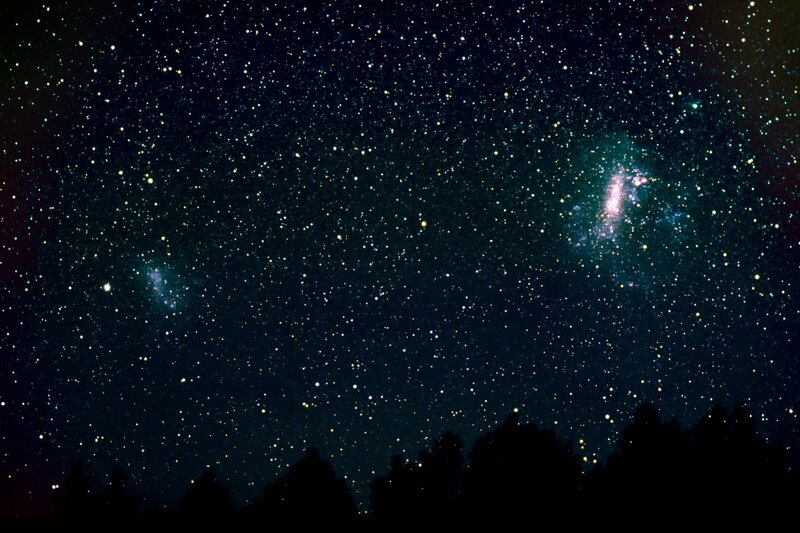 There are currently two main theories describing how these binary systems become supernovae. Studies like the one that has provided the new image of N103B — that involve searching for remnants of past explosions — can help astronomers to finally confirm one of the two theories. One theory assumes that both stars in the binary are white dwarfs. If the stars merge with one another it would ultimately lead to a supernova explosion of type Ia. The second theory proposes that only one star in the system is a white dwarf, while its companion is a normal star. In this theory material from the companion star is accreted onto the white dwarf until its mass reaches a limit, leading to a dramatic explosion. In that scenario, the theory indicates that the normal star should survive the blast in at least some form. However, to date no residual companion around any type Ia supernova has been found. Astronomers observed the N103B supernova remnant in a search for such a companion. They looked at the region in H-alpha — which highlights regions of gas ionised by the radiation from nearby stars — to locate supernova shock fronts. They hoped to find a star near the centre of the explosion which is indicated by the curved shock fronts. The discovery of a surviving companion would put an end to the ongoing discussion about the origin of type Ia supernova. And indeed they found one candidate star that meets the criteria — for star type, temperature, luminosity and distance from the centre of the original supernova explosion. This star has approximately the same mass as the Sun, but it is surrounded by an envelope of hot material that was likely ejected from the pre-supernova system. Although this star is a reasonable contender for N103B’s surviving companion, its status cannot be confirmed yet without further investigation and a spectroscopic confirmation. The search is still ongoing. A white dwarf is the small, dense core of a medium-mass star that is left behind after it has reached the end of its main-sequence lifetime and blown off its outer layers. Our own Sun is expected to become a white dwarf in around five billion years.